Kangaroos are a group of marsupials classified as macropods, or "animals with big feet." Their distinct appearance features large and heavy hind paws, thick and muscular legs, a long and stout tail, and small forepaws. Their primary means of locomotion is hopping, though they are capable of moving more slowly using their tails and forepaws. With the exception of tree kangaroos, forepaws are small and similar to human hands. They have five toes, each curved and clawed, that they can use for grabbing, eating, grooming and fighting. They also use their forepaws to help keep themselves cool by licking them and smearing the saliva onto their bodies. The forepaws also serve in conjunction with the tail for "crawl-walking," a means of locomotion that allows them to move more slowly than hopping. One of a kangaroo's most recognizable feature is his large hind paws. The hind paws have several uses, including acting as an alarm to warn other kangaroos of danger. When a mob of kangaroos is threatened, the kangaroos beat their large feet on the ground to warn other members of the threat. The hind paws also serve to settle disputes between jacks over breeding rights. Interestingly, a kangaroo cannot move his hind legs independently, which is why the animal's primary means of getting about is long, fast hopping. 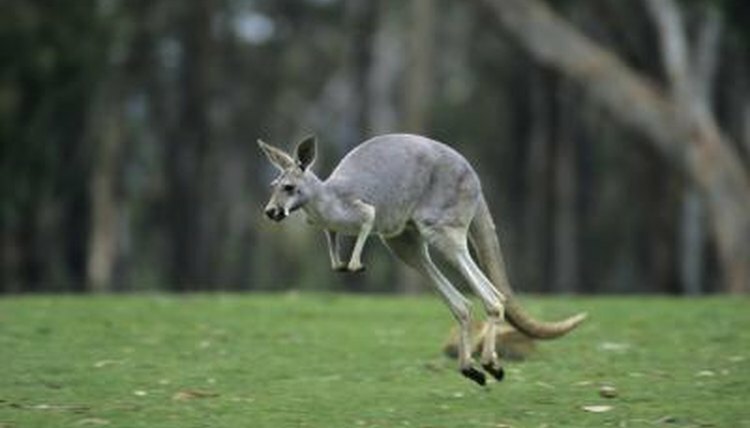 A kangaroo would have difficulty hopping, walking or even standing without his amazing tail. A kangaroo's tail is capable of supporting the creature's entire body weight and serves as a prop to stabilize the animal when standing. It provides counterweight when the animal hops so the creature does not pitch over on his face. It serves in crawl-walking, too; and when a kangaroo fights, he can stand on his tail, holding his opponent with his forepaws and trying to disembowel his opponent with his sharp hind claws. Tree kangaroos are similar to ground-dwelling kangaroos, but their paws have evolved to facilitate life in the trees. They have a broader range of motion in their hind feet and coarse pads on all four of their feet to improve their grip. Their forepaws can bend at the wrist, and their first and second fingers are opposed to the other three, allowing them to grab. While their hind paws are larger than their forepaws, the difference is not nearly as pronounced as with ground-dwelling kangaroos. Which Animals Use Their Tails to Keep Balance?